Regurgitated crap. Save yourself the money and go buy Rage Against The Machine's "The Battle of Los Angeles." My sentiment while listening to this album was "been there, done that and shouldn't have to pay for it again." 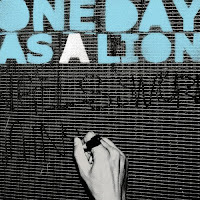 One Day As A Lion is a duo consisting of the infamous lead singer Zack de la Rocha from Rage Against The Machine and drummer Jon Theodore formerly of The Mars Volta. Imagine Rage Against The Machine stripped of its deep bass lines and signature Tom Morello guitar rifts and you have ODAAL. What's left you ask? Just de la Rocha's angst filled voice screaming his political views to drum beats and keyboard/synth sounds. This album does prove (to The Captaion anyway) that de la Rocha is a major part of Rage Against The Machine's sound. So much that you could fool most people into thinking this was a new album from Rage and not just a side project. There are a few positives to this album, namely the song "Ocean View" in which de la Rocha actually sings. The other - it's only 5 tracks long and you can get it for $5.99 at most record stores! I must say I totally agree with you, but haven't written that much because the EP didn't motivate me enough. But I'd like to hear Zack singing more like he did in Ocean View. Really. Yar, methinks the Cap'n may be on to something. i came for the drumming, and not much else. no, thank you. i will continue to stop by! Glad you like it. I set up a link to your blog from mine. I hope that's okay.